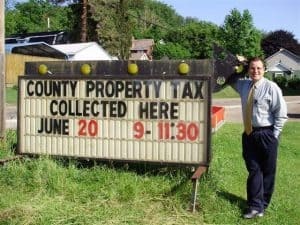 In June of 2008, Treasurer Richard Rapone put into place the Lawrence County Tax Outreach Program. Through this program, Treasurer Rapone felt he could give back to taxpayers by helping them economically in traveling around the County. This marked a milestone of innovation in tax collecting. He plans on starting the Outreach Program earlier next year in order to provide the service during the discount period.